When I looked into my fridge at the beginning of this week, I noticed a distinct side effect of T's unplanned absence- quite a lot of vegetables reaching the point of *needing* to be eaten. I like vegetables, I do, but there's only so many one girl can eat when she's home alone for just one meal each day. So I inflicted my food upon some friends for an evening and decided I fancied something a bit inspired by the Vietnamese noodle soup dish Pho. I can't really call this Pho, as I'm pretty sure anyone Vietnamese would swing for me. It's the lazy version of something a bit like Pho, I thought it was yummy. 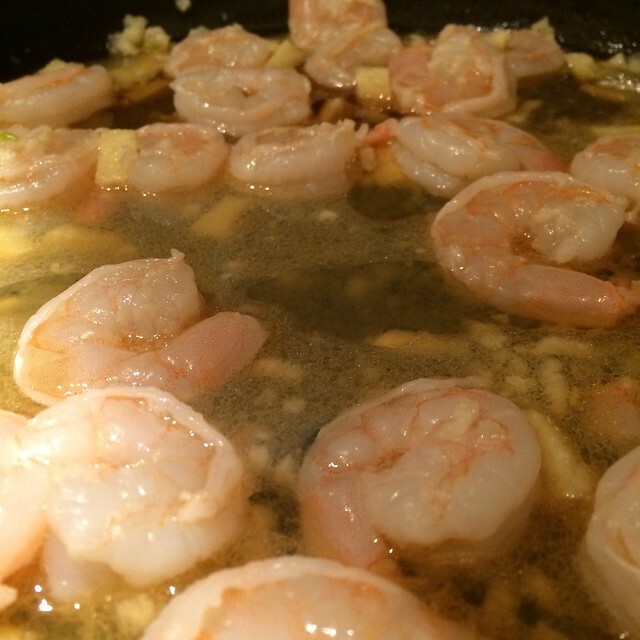 I wanted to use prawns in mine- these are frozen prawns which come peeled but raw- perfect for shoving in a pan with sesame oil, lemon juice, fresh ginger and crushed garlic, until only just cooked. 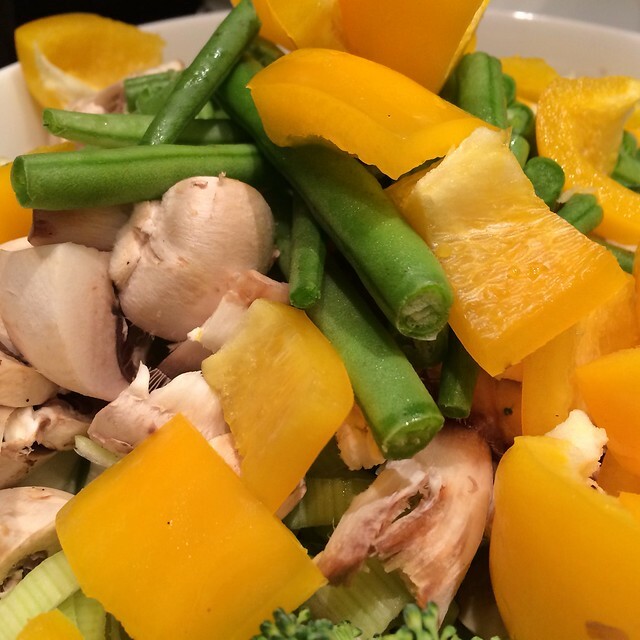 Leeks, broccoli, peppers, mushrooms and green beans- all lurking in the fridge, threatening to go over. I'm sure Spring Onions are usually in oriental dishes, but I had leeks. I'm sure broccoli might seem and odd choice, but I promise it was in bite size pieces, and it needed using. Technically, noodle soups like Pho are supposed to be made up with a broth that is a bit of a labour of love to make yourself. Don't get me wrong- the depth of flavour and all the different combinations taste amazing, but I got home 40 mins before I needed to cook, and I was soaked to the skin from cycling in the rain and needed to jump through the shower too. Whilst that's gently bubbling away, prep up your vegetables- make them bite sized so people can use chop sticks or cutlery, ditch them all in a bowl to one side, and add to the 'broth' 10 mins or so before serving. I added prawns to mine- I marinated them in sesame oil, lemon juice, crushed garlic and fresh ginger whilst doing everything else, then turned the heat on them for 3-4 mins just to cook them through. I like my prawns to be on the 'rare' side... You could use cooked chicken- this could be great using leftovers from a roast chicken, I think beef is traditional, salmon would be awesome- especially a teriyaki version (something I've been eyeing up making recently) or anything else you fancy using up. 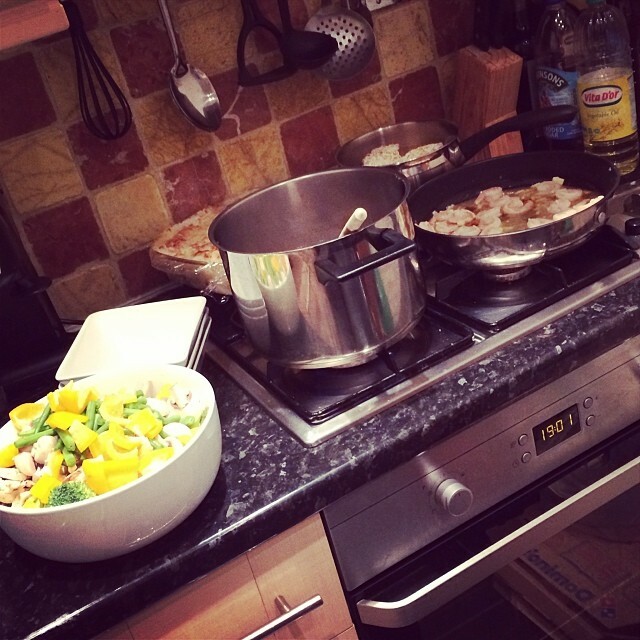 Kitchen mayhem.... Prawns marinating, vegetables prepped, broth cooking, noodles soaking. Rather than cook my noodles, I just sat them in boiled water for 5 mins, then chucked them, the prawns and all my veg into the pan with broth, mixed, and served. A pretty easy use up, this makes LOADS- 3 portions for dinner and another 4 left in the pan. Next time I'll be attempting to down scale a little. On the plus side.... lunch time is sorted!